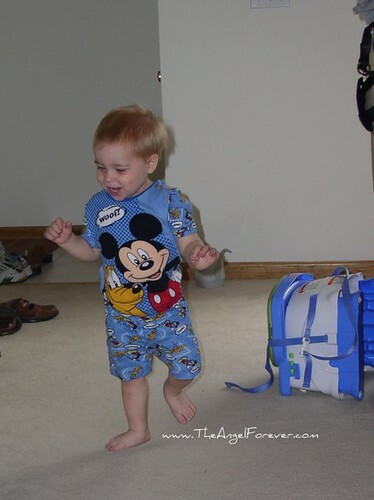 Do you remember where your children were the first time they walked multiple steps on their own? JSL started really toddling on his own in the last two weeks. It made me think back to when NHL took his first steps. We waited so long for that day to come that I recall where we were, what was going on, and exactly what the little guy was wearing. We were visiting my brother and sister-in-law. NHL had just started physical therapy after qualifying through Early Intervention. He was diagnosed as having low muscle tone and was hyper flexible. In other words he could touch his nose to the floor while sitting and struggled just to have enough balance to stand, no less walk on his own. We had no clue at the time that this was going on. He was our first born and we thought he was so close to walking for months. He could toddle holding simply a finger, but without it could not. Just a few days after starting PT we went away for a weekend. All of the adults were talking when we suddenly noticed a little boy walk by us. We did many double takes and then hooted and hollered since NHL was indeed walking on his own. JL quickly went to get the camera to capture these first steps on his own. Before we knew it he went back down the hall on his own. Later that afternoon we went to the Fisher Price outlet store. My little guy walked in the store on his own, chanting Elmo when he saw all of the toys he wanted to go to. 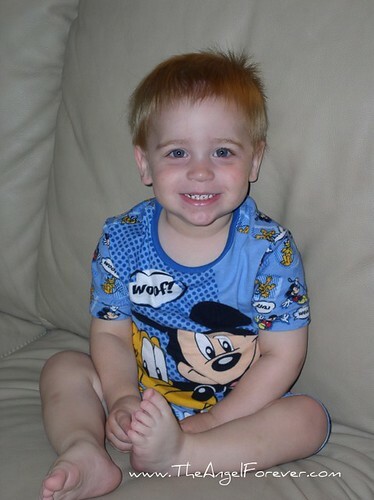 Here are NHL’s first of many solo steps and relaxing on the couch in his Mickey Mouse PJ’s. These were taken July 6, 2005 when NHL was almost 23 months old. We always joked that JSL would walk for the first time at Uncle I and Aunt M’s house. That was not to be in July when we visited. JSL did things on his own schedule and really started to perfect things this past week. By the end of the weekend visiting for Cousin S’s first birthday he had really picked up speed. While gathering clothing from NHL to get ready for JSL I found a lot of summer items. 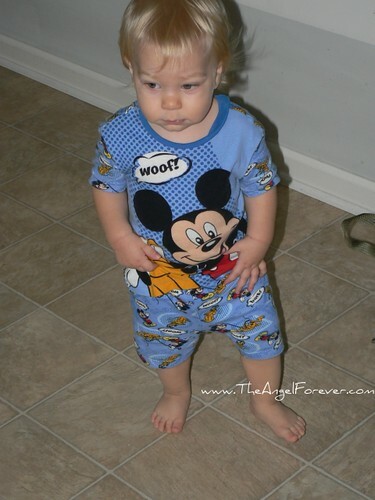 Included in this were the Mickey Mouse PJ’s that NHL was wearing when he walked. I thought it was only fitting to take these with us this weekend to get some photos of JSL. 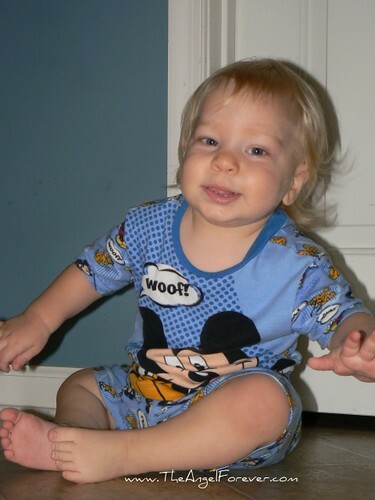 These photos were taken September 14, 2008 as JSL turned 16 months old. Now the adventure really begins as JSL is starting to chase after his big brother. . . . ah the memories! Great photos! Congratulations! The races are on! Those first steps are so exciting! I bet NHL’s steps were especially exciting to you after waiting so long and working toward that time. Sweet! What a sweet post! I love the pictures of the boys in the same outfit. You know, Bridoodle can put her foot in her mouth. I wonder if her muscle tone is low. But she’s only twelve months old. It’s probably too early to worry. Too cute! I love seeing Lucas in things Logan has outgrown! Funny you talk about hyper flexible. A couple of nights ago I heard Lucas running around after we put him to bed. I decided to go in and check on him before I went to bed because I had the feeling he’d been sleeping on the floor based on where I was finding him in the mornings…mostly under his bed. I went in to find him in a sitting position except leaned all the way over with his head on the floor. I picked him up and he stayed in that position….and asleep. When I put him in his bed, he tried to stay in that position. I pulled his legs out and laid him on his tummy. He sits like that often! !